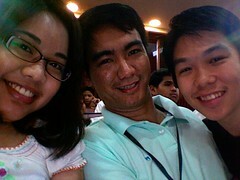 I’m here at the iBlog4, the 4th Philippine Blogging Summit at the UP College of Law. I wasn’t planning on attending but I was dragged here by Ederic. On a regular day, I wouldn’t have come but I wanted to see Josh at work on his new segment for News On Q. For those who are regularly watching the news on QTV11, watch out for ‘tech guy’ Josh on his new segment. Back to iBlog. The topic right now is problogging or blogging as a profession. I haven’t really thought of blogging as a career option but hearing about some bloggers who are earning more than I do makes me think twice about becoming a full time blogger. In the meantime I’m looking for some ways to earn online. My latest project is Hallyudorama.com which features episode guides of Korean and Japanese dramas. It’s a joint project with my friend Hannah and we’re hoping it would pick up steam soon. Next topic is about photoblogging. I would love to photoblog but being cramped in an office five days a week makes that a bit more difficult. Meanwhile, here’s a picture of Ederic, Josh and myself just hanging out here at the iBlog. Hope everyone has a fab weekend!